The federal income tax code is full of complicated deductions, credits, and loopholes, which together exempted $1.2 trillion from taxation in 2009. 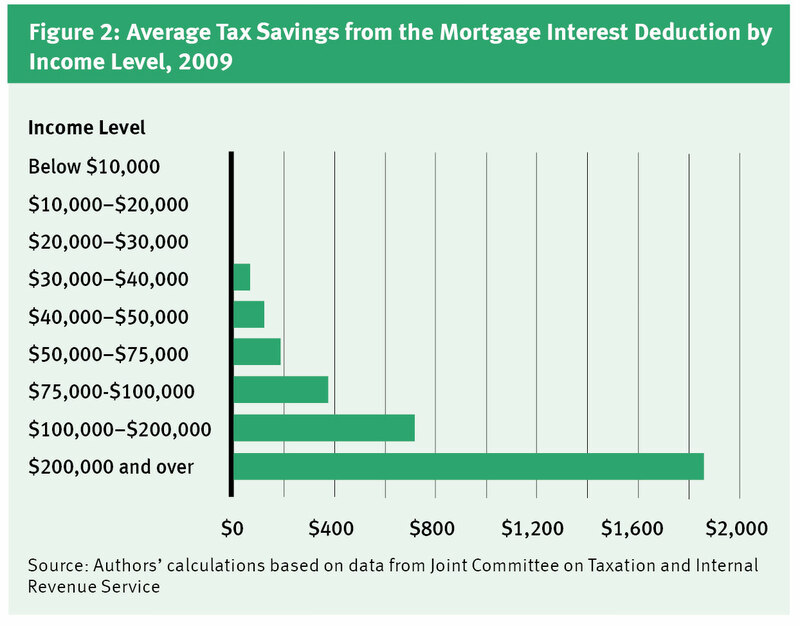 The single largest benefit, amounting to around 35 percent of the total, is the mortgage interest deduction. This longstanding incentive, which allows individual taxpayers to deduct up to $1.1 million in home loan–related interest payments from their taxable income, has warped the real estate market and overwhelmingly benefited higher-income Americans, all while failing to achieve its stated policy objection of promoting homeownership. As Congress continues to debate federal budgetary and tax policy in an atmosphere of debt ceilings and ratings downgrades, the time has come for the mortgage interest deduction to go. All taxes on income create distortions in economic decision-making. The more something is taxed, increasing its relative cost, the more individuals will substitute a good that is comparatively cheaper. This is as true of taxes on income produced by labor and capital as it is of taxes on goods and services. Such market distortions reduce efficiency, creating what economists call excess burden or deadweight loss. The least distortionary income tax system is one with the broadest possible base and the lowest possible marginal tax rates. If that $1.2 trillion in itemized deductions was instead spread throughout the tax base, the average tax rate could be reduced by roughly a fifth, from 17.8 percent of taxable income to 14.5 percent. Such a tax cut would directly increase the reward for productive, income-generating activity. Closing loopholes such as the mortgage interest deduction while lowering overall rates would lead to a more productive economy. Some form of the mortgage interest deduction, or MID, has been in existence for as long as the income tax itself. On the very first federal tax form in 1913, a taxpayer was allowed to deduct “all interest paid within the year on personal indebtedness of taxpayer.” Back then, very few people actually paid income taxes: The income bracket levels were set very high and rates very low, so only the very rich had to contribute. As a result, the distortions in individual decision-making created by the interest deduction were relatively small. During World War II, tax rates were hiked substantially to raise revenue for the war effort, while exemptions and tax brackets were significantly reduced. The broadening of the income tax to more than just the highest-income individuals, combined with an increase in homeownership rates, greatly expanded the impact of the mortgage interest deduction. In 1986, the Reagan administration embarked on an ambitious plan to eliminate loopholes from the tax code in order to reduce marginal rates. The resulting tax reform deal eliminated interest deductions on credit card balances, car loans, and most other kinds of loans. But the mortgage deduction remained. The main policy reason cited to justify the tax break for mortgages is the belief that it helps increase the homeownership rate, which in turn promotes social stability, responsibility, and wealth creation. Homeowners tend to treat their property better than renters do (just as car owners treat their own cars better than cars they rent), therefore increasing the value of that property and the property of their neighbors. If the deduction had a significantly stimulative effect on homeownership, we would expect to see a fast and continuous increase in the ownership rate as the dollar amount of the deduction continued to rise. But that has not been the case. 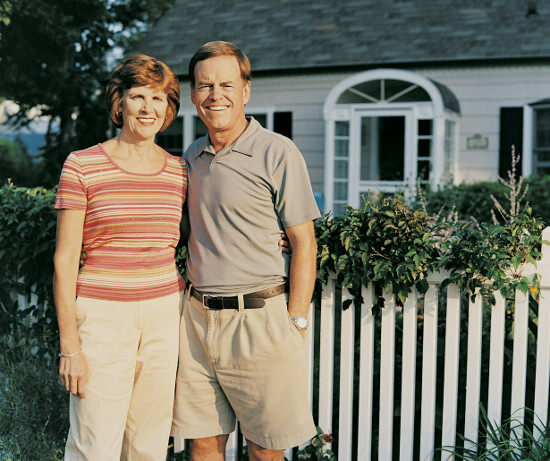 For example, the dollar amount effectively doubled between 1995 and 2008, with little noticeable effect on how many Americans owned their homes. The primary impact of the deduction is to increase the amount spent on housing by consumers who would choose to own anyway, thereby subsidizing housing-spending rather than homeownership. One possible reason the deduction isn’t converting consumers from renters into owners is that the promise of homeownership as an investment vehicle is routinely overstated. A 2011 study by the economists Eli Beracha of East Carolina University and Ken H. Johnson of Florida International University concluded that if individuals had the same amount of money to spend on housing and investment between 1978 and 2009, a majority of renters would come out ahead over the 30-year period. That’s because rent tends to be cheaper and more flexible than mortgages, and people could use their excess income to invest in the capital markets, which tend to outperform housing prices over the long haul. Encouraging existing homeowners to go further into housing debt creates numerous distortions to the allocation of capital, since housing consumers have been using credit rather than their own assets to finance home purchases. This was a direct contributor to the housing bubble and subsequent collapse, which has driven rates of homeowner equity steadily downward, to below 50 percent. So not only did the deduction help create a damaging bubble, it did so while contributing to the reduction of overall ownership. If you eliminated the mortgage interest deduction but kept the move revenue-neutral by lowering marginal tax rates, a sizeable majority of taxpayers would benefit. So who would stand to lose? 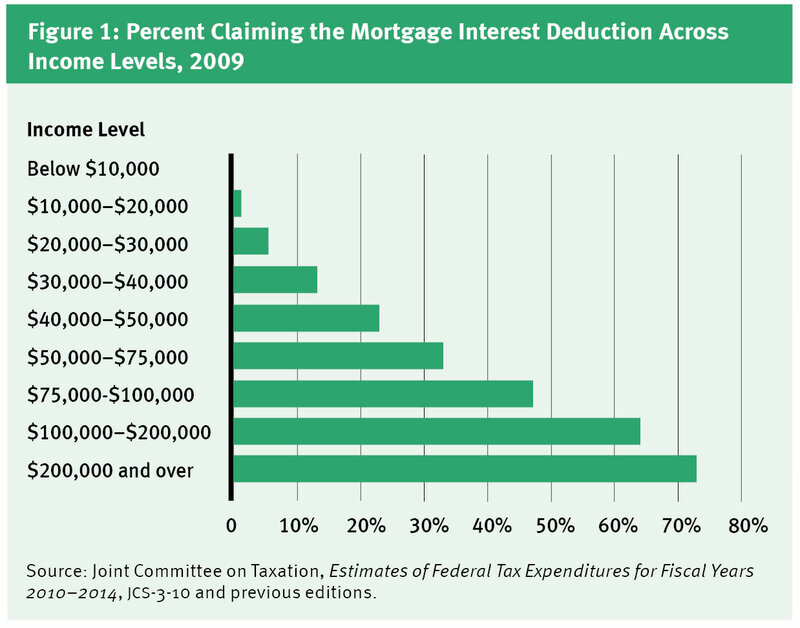 In 2009, only 22.1 percent of federal income tax returns contained the mortgage interest deduction. (The figure has remained between 21 and 26 percent since 1991.) Data from the congressional Joint Committee on Taxation (JCT) shows that only a small portion of taxpayers with incomes below $50,000 claim the deduction. In contrast, two-thirds of those with incomes above $100,000 do so (see Figure 1). The reason for this disparity is twofold. First, homeownership rates are much lower in lower-income groups. Second, lower-income homeowners are far less likely to itemize because the sum of those deductions would frequently be lower than the standard deduction. Even when they do itemize, the incremental benefit over and above the standard deduction is often quite small and not worth the effort. Furthermore, higher income taxpayers stand to benefit more because they have larger mortgages and face higher marginal tax rates. How big is the benefit? According to the JCT, after you adjust for the difference between the standard deduction and the mortgage deduction, for a taxpayer with average income, the mortgage interest deduction is about $10,000 but only reduces taxable income by $7,600. At the 2009 average tax rate of 12 percent on adjusted gross income, that amounts to a tax savings of $912, or $76 a month. But these numbers provide an incomplete picture, since the tax savings can vary substantially based on income level, age, and location. Using the most recent data from the JCT and the Internal Revenue Service, we found that taxpayers with incomes below $75,000 save less than $200 per year, while those with incomes above $200,000 save about $1,800 (see Figure 2). As a percentage of their overall tax bill, however, the lower-income groups save more. Proponents of keeping the mortgage interest deduction often claim that repealing it would cause housing prices and therefore homeownership rates to fall. Lawrence Yun, chief economist for the National Association of Realtors, has repeatedly warned that getting rid of the deduction could reduce housing prices by 15 percent. “Whatever deficit reduction might be realized by taking a carving knife to the [deduction] would come at an intolerably steep price: trillions of dollars in wealth destruction and a new uncertainty in what has long been recognized as a bedrock of our economy,” Yun wrote last year. Even assuming Yun’s estimate is correct—and there are a number of studies suggesting the deduction has a much lower impact on home values—there is scant evidence that higher housing prices are a good thing in themselves. Typically we associate a decrease in price (and increase in quality) with innovative growth, not with problems that the federal government need to solve. Housing price appreciation is only “good” from the perspective of owners using their property as investment assets. Surely those who are currently priced out of the housing market wouldn’t consider a 15 percent decrease “intolerably steep.” And the removal of artificial government barriers to housing depreciation would be the best way for the market to find bottom, begin clearing backlogged inventory, and start the road to real recovery on a stronger financial footing. The mortgage interest deduction has come under in­creased scrutiny over the past two years as part of deficit-reduction talks in Washington. So what would reform look like? There are three main possibilities: tweaking the deduction to better meet its stated policy goals, repealing it outright, or coupling its elimination with adjustments in the tax code to make the move revenue neutral. Before choosing one of these three, policymakers should consider whether promoting homeownership is even an appropriate role for government. We would argue that it is not, as borne out by the last two decades of ownership-goosing policies that contributed to the inflation and then collapse of the housing bubble. Most proposed changes to the deduction thus far have sought to balance out its inherent favoritism toward wealthy homeowners. The December 2010 report by the presidentially appointed National Commission on Fiscal Responsibility and Reform (known as Simpson-Bowles, after co-chairs Alan Simpson and Erskine Bowles) proposed scrapping the deduction for a tax credit that would be capped at 12 percent of paid interest while lowering the maximum amount of the loan this could be applied to from $1.1 million to $500,000. Other proposals have suggested lowering the maximum mortgage interest available for deduction rather than creating a tax credit. These changes would promote homeownership more effectively by targeting the subsidy at those who are on the margin between renting and owning, rather than simply encouraging higher spending on housing by those who are already homeowners. But like other recent tax policy attempts to jump-start the housing market, it is likely that such changes would have unintended consequences and end up becoming different means of creating similar distortions in economic decision making. The better, though more politically challenging, option is to completely eliminate the mortgage interest deduction from the tax code. This would mostly affect young wealthy homeowners, with little negative impact on most other households. Low-income families would likely benefit, since any subsequent decline in home values would make housing more affordable. The housing market, which as of this writing has a three- to four-year supply of homes available, would be able to clear some of its inventory, possibly boosting homeownership rates in the near term. But eliminating the mortgage deduction without any other adjustments would increase taxes for the one-fourth of taxpayers who use it to reduce their taxable income. Had the deduction been fully eliminated in 2008, households earning between $100,000 and $200,000 a year would have seen a collective tax hike of $10.2 billion that year. Households making less than $100,000 would have paid $4.2 billion more in taxes. It is true that the deduction distorts the economy, but a sharp increase in tax liabilities would also have negative economic consequences. Policymakers who are more concerned with the benefits of reducing the debt than the impact of a tax increase may find the elimination-only route the most enticing. According to a report by the Joint Committee on Taxation, ending the deduction without any other income tax adjustment could cut as much as $94 billion from the fiscal year 2011 federal budget deficit, or around 6 percent. The question for policymakers is whether this deficit-cutting cash is worth a not-so-tacit increase in income taxes by more than 9 percent. The most appropriate policy action would be a complete elimination of the mortgage interest deduction combined with reductions in marginal income tax rates to make the repeal revenue-neutral. Given that a full repeal would have broadened the tax base by $470.4 billion in 2008, we estimate that the 2008 average tax rate of 18.2 percent could have been lowered nearly 8 percent, to an average rate of 16.8 percent, without reducing the amount of revenue collected. It is likely that a full and immediate repeal would face staunch opposition. And an overnight change may also be poor tax policy considering that some individuals depend on the mortgage interest deduction to afford their home. Therefore, we suggest phasing out the deductions for existing mortgages in much the same way deductions for credit-card and car-loan interest were phased out in the 1980s. Policymakers could end the deduction for new mortgages while targeting a specific tax year that it would go away for existing mortgage holders, and reduce the mortgage interest cap a certain percentage each year. This would soften the impact on existing mortgage holders. While the mortgage interest deduction is one of the most popular provisions of the federal income tax code, its actual impact is poorly understood. It is ineffective at promoting homeownership and has a negative impact on the housing market by distorting the allocation of capital in the economy. The deduction overwhelmingly benefits high-income households and comparatively wealthy young people with large mortgages who have not paid off much of their loans, particularly in wealthy, high-tax states such as California, New York, Massachusetts, and Connecticut. By contrast, low-income households that do not itemize and senior citizens with little mortgage debt get almost no direct benefit from the deduction. Instead of promoting homeownership, the deduction promotes an increase in personal debt for young and high-income households. This contributed to the buildup of the housing bubble during the early 2000s, when more and more debt was used to finance homes. In the end, when the price bubble collapsed, individuals were left with very little equity in their homes, erasing all ownership gains of the last decade and putting the market back to levels seen in the 1990s. If the elimination of the deduction leads to more financing by other means than excessive debt, we would likely see a much healthier housing market in the future. In a June paper for the National Tax Journal, the MIT economist James Poterba and the University of Pennsylvania economist Todd Sinai estimate that taxpayers could reduce their mortgage debt by 30 percent, or as much as 70 percent by liquidating all investments and assets, if the deduction were repealed. Any substantive mortgage-debt reduction like this would be beneficial to the economy, putting households on more stable financial footing and making them less vulnerable to sharp downturns in the market. A repeal coupled with a matching tax rate reduction would reduce taxes for 75 percent of taxpayers while creating a more efficient tax system, one that produces fewer distortions in the market while encouraging economic growth. And as the housing collapse enters its fourth year, we need all the growth we can get. Dean Stansel (dstansel@fgcu.edu) is an economics professor at Florida Gulf Coast University. Anthony Randazzo (anthony.randazzo@reason.com) is director of economic research at the Reason Foundation. This article first appeared in the November 2011 issue of Reason magazine. UdxDH7 Thanks for sharing, this is a fantastic blog article.Much thanks again. Really Cool. wZrT16 I appreciate you sharing this blog post.Really thank you! Great. EDXap6 Thank you for your blog article.Thanks Again. Fantastic.